Chaitra Vedullapalli is currently the CMO of Meylah, turnkey native marketplace platform. 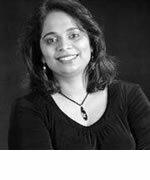 Chaitra is a co-architect of Ignite Washington, a city by city digital readiness initiative to foster local economic development. Chaitra has a proven track record of enabling global transformations, architecting innovative business models and leading communities with excellence. She is recognized as Top 100 Small business influencer and holds a patent in Web Methods. She was a Senior Director of WW Sales and Marketing Communications, where she led social enterprise implementations and shaped Microsoft Customer and Partner Self Service Experience, which impacted over 10M Customers and 1M Partners.